Yesterday I was looking through my photos, trying to remember what I had called a new set of photos that I had just downloaded and I came across these photos of a chair I painted a few weeks ago. It had been hanging around the store where I work sometimes and sell my furniture, Vera's Daughter Home, and just needed a new look. 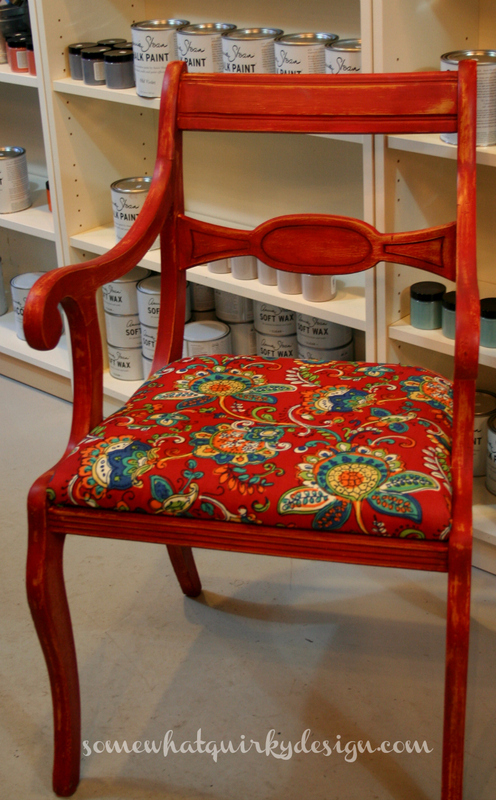 It was the first thing Becky (the owner) ever painted (with Chalk Paint®). She had just returned from her first class working with Chalk Paint®, and proceeded to paint practically every piece of furniture in the house. 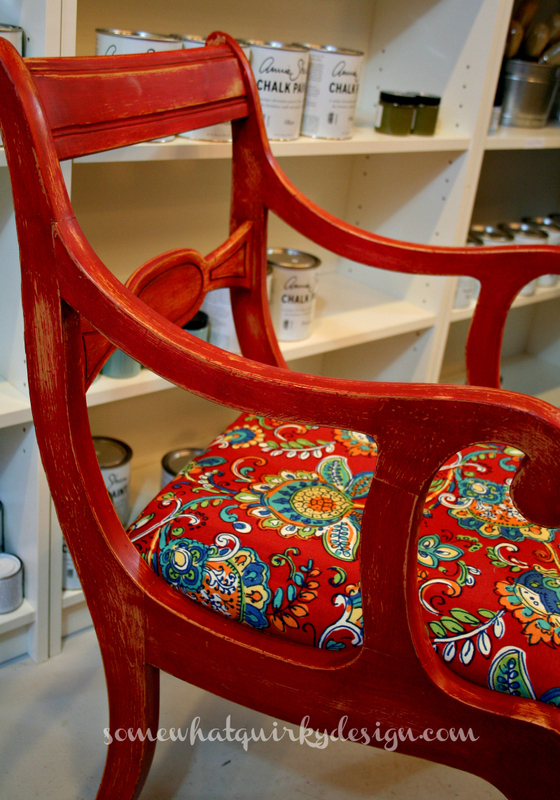 Do you remember the first piece you ever painted with Chalk Paint®? I had been painting furniture for like a hundred years. But this newfangled fancy paint for which I had to pick a color online and wait for it to arrive in the mail . . . it was a whole new world. This table was actually a project for a friend's mother or grandmother. We thought we were picking a cream color. If you've ever picked paint from an online picture you've probably done something similar. Turns out I LOVE this color. Arles. Then Miss Mustard Seed started making milk paint. And it stole my heart. if I were painting it today it would have been painted with milk paint. Because some pieces just scream MILK PAINT ME!!!!! I'm also a fan of using the two products together. It's an equal opportunity chair. 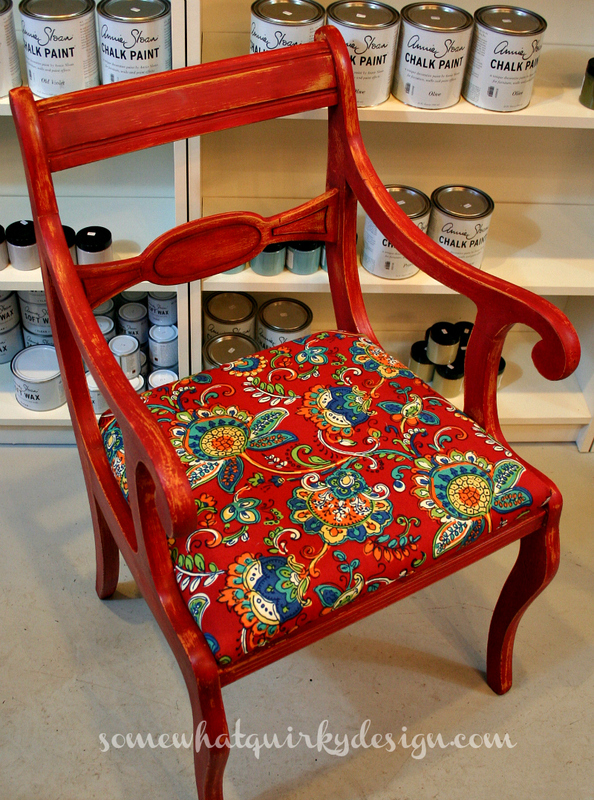 This Arles chair needed to be red. For the red front window display for February. And you know I've got a thing for red with my Arles. The wax that had been on the chair for four years was tough as ever so I cleaned it with mineral spirits - several times. Mineral spirits dissolve wax. It is my cleaner of choice for furniture. I had been wanting to make something with Miss Mustard Seed Tricycle Milk Paint. I mixed up the milk paint a little thicker than I normally would (only slightly) and painted the chair. No bonding agent. The paint covered completely and did not chip at all. If I had moved straight to waxing or used hemp oil the paint would likely have cured with little or no chipping. But I thought it would be silly not to sand it back at least a little. I sanded the whole piece with 220 grit and what you see is what I got. Then I waxed it with MMS Furniture Wax and Antiquing Wax. The whole process took like 2 hours. 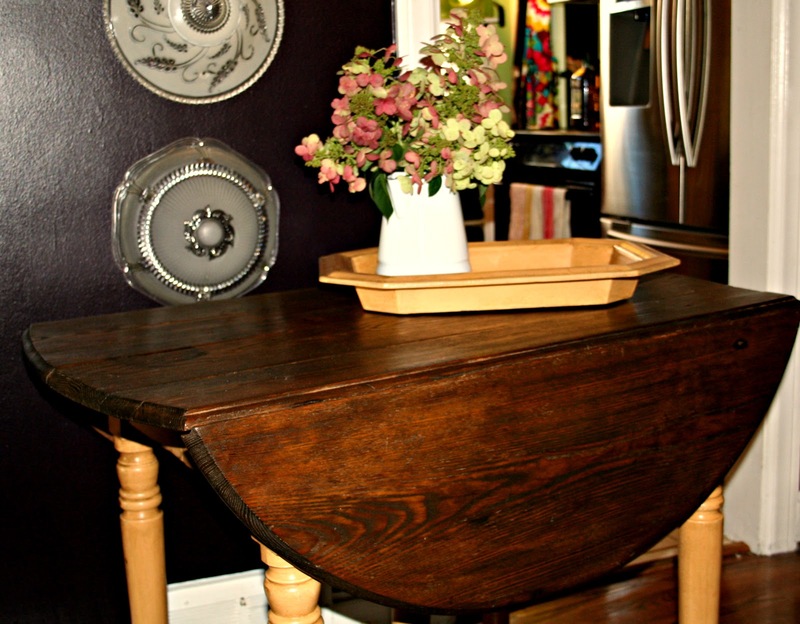 Sometimes milk paint is the absolute easiest paint to use. Some new fabric on the seat and she's a beauty all over again. She's a "Miss Fancy Pants" now! I love milk paint. 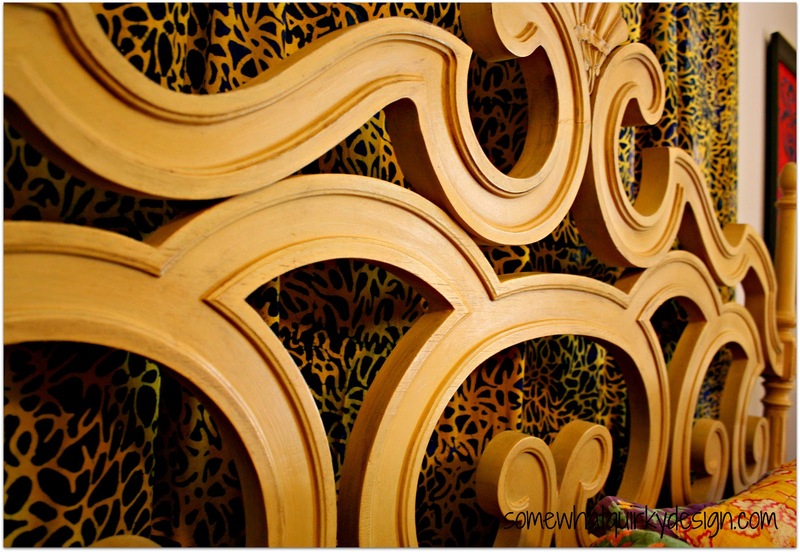 Your pieces are lovely, but i'm too much of a control freak to enjoy milk paint, which is too unpredictable for me! 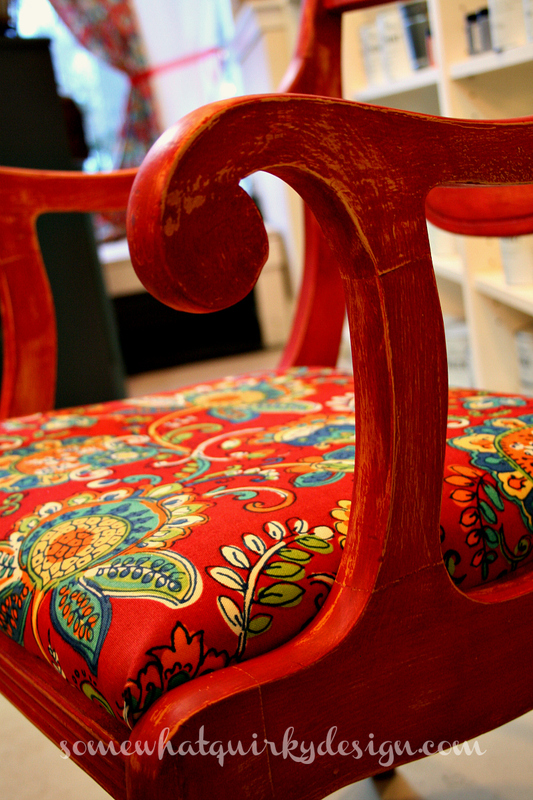 Gorgeous chair! I have some milk paint but haven't used it. I need to mix it up and try it. Something new and I just haven't taken the time to do something with it. I'd have to think to figure out my first chalk paint piece and I don't feel like thinking right now, but your chair looks marv. Turned out fabulous. I am debating on which caulk paint to start a first project. This sounds promising. Thanks.